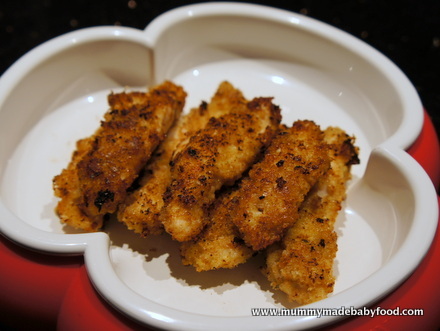 Here is a great recipe to include in your baby finger foods lineup - a variation of the classic chicken nugget. 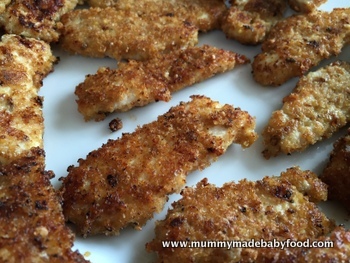 Chicken nuggets are tasty and fun to eat, but this home made version is much healthier than commercial varieties and those available from popular fast food restaurant chains. Chicken fingers tend to be made from the white breast meat of the chicken, whereas chicken nuggets are made by reforming scraps of chicken meat and other filler ingredients. Not only does this recipe contain Parmesan - because, let's face it, who doesn't like a bit of fried and melted cheese - but it is also marinated in a honey mixture, so the chicken meat is infused with a subtle sweetness. Because the recipe includes honey, do not offer it to babies less than 1 year of age. 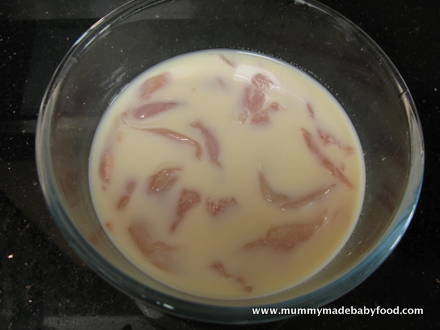 The milk marinade also helps to tenderise the meat, making it easier for babies to chew. When offering your baby finger foods, start off by giving him small pieces of soft food. Once you are confident he can handle these, you can increase the sizes and move onto more textured food. You may find that you need to cut these chicken fingers into smaller pieces initially, especially if your baby is not yet a confident chewer. Marinating the meat should make it tender enough so that even without molar teeth at the back, your baby should manage to chew small pieces at a time. Cutting the meat against the grain will also make it easier to break into pieces as your baby chews. Although this recipe is quick and easy to cook, some advance preparation is needed for marinating the chicken strips, so make sure to plan ahead. Serve this with some home made Sugar-Free Tomato Ketchup or a side of your baby's favourite veggies. This recipe yields approximately 4-5 servings. Mix the milk and honey together in a bowl. 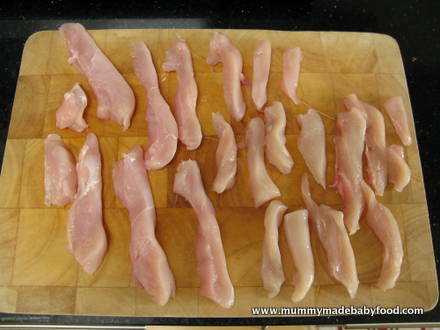 Cut the chicken into strips against the grain. Place the chicken into the milk mixture, making sure all pieces are coated. Cover and marinate in the refrigerator for at least an hour. Heat some oil in a frying pan until hot. Dip the marinated chicken strips into the beaten egg, and coat well with the breadcrumb mixture before placing into the frying pan. Cook for a few minute on each side until golden and the chicken is cooked through. Allow to cool sufficiently before serving. By Wendy Liu Penderis, Copyright © 2013-2018 Mummy-Made Baby Food. All rights reserved.